Word for Today: Be conscious of your glorious oneness with God in Christ. Word for Today:Be conscious of your glorious oneness with Christ. 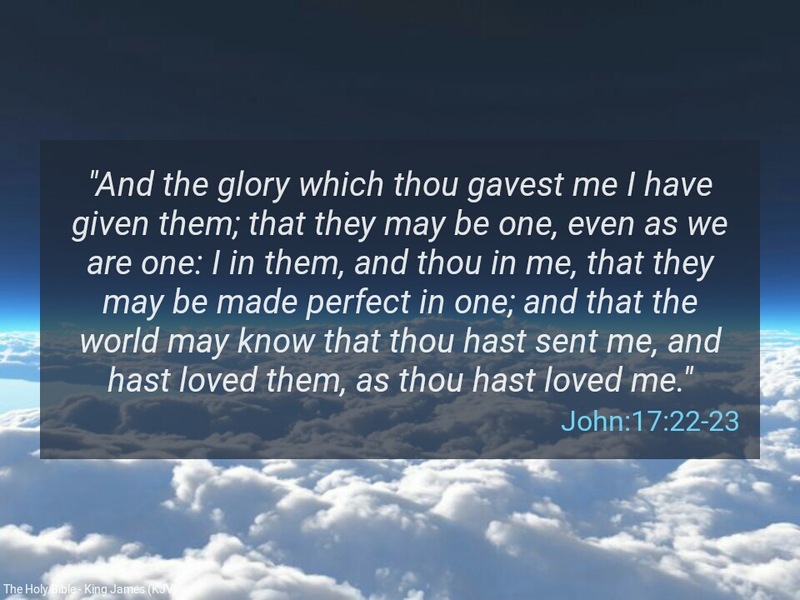 “And the glory which thou gavest me I have given them; that they may be one, even as we are one: I in them, and thou in me, that they may be made perfect in one; and that the world may know that thou hast sent me, and hast loved them, as thou hast loved me” (John 17:22-23). In John chapter 17, Jesus Christ prayed earnestly for all true believers to be one with Him as He is one with His Father. Without Jesus Christ, also called the Word (John 1:1), our lives can never be complete. The Scripture says: ‘And ye are complete in him, which is the head of all principality and power’ (Col 2:10). In Christ Jesus, God wants all his children to be one with him in thoughts, words, actions and purpose. Jesus was completely one with his Father. He tells us that in the book of John, where He stated: ‘I and my Father are one’ (John 10:30). The only thing that can prevent man becoming one with God in Christ is sin. The eyes of God are too pure to behold sin (Hab 1:13), in as much as He loves sinners. Dear Father, thank you for making me ONE with you through your beloved Son Jesus Christ. It’s amazing that we share in your glory. Thank you Father, in Jesus mighty name. Amen. Previous Previous post: MOW: Embrace the true source of light-by pastor Chris Ibia .